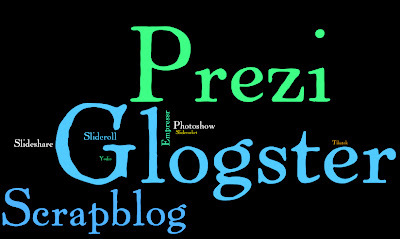 Our final day of Middle School technology presentations today and a surprise at the end with Glogster just managing to pip Prezi at the post for the most popular Web 2.0 tool with our Grade 7 students. About a third of our students chose to use Glogster and roughly another third chose to use Prezi. Of the rest Scrapblog was the next most popular tool. Because this was the last day before the holidays, all those students who had already shown their work over the past few weeks were given a free choice on the computer, while the final few students showed us what they had created. It will come as no surprise to anyone who has been following these posts, that the students all opted to make something else, using a Web 2.0 tool of their choice. There was no fooling around and time wasting - these tools were engaging and fun enough in themselves. What I'm interested to see now is whether these students will take these tools and use them in their other subjects. For example, will we start seeing Glogs and Prezis being used in English or Humanities lessons - and are these subject teachers even aware that compared with just 2 months ago, our Grade 7 students have a far wider range of skills? Will they accept a Glog instead of a book report? Will they accept a Prezi about the Second World War? This week I have been reading a number of posts about Speed Geeking, for example Clint Hamada's post today entitled Get Your Geek On showcasing some of the cool things going on in the UNIS Hanoi classrooms. Perhaps this is the way forward. But perhaps instead of the teachers showcasing what they have done, we could have the students showcasing to the different subject teachers some of these different tools that they have used in the MYP technology classes. Definitely worth a thought! I often wonder the same thing about my students, will they take what they are learning in my class and understand that it can be used for other applications? I don't think it always comes to mind right away because they are so used to being confined in the ways they can present. I hope to continue to change this! Maggie, thanks for the link-love! I think our Speed Geeking worked because it was all about teachers sharing things that they have already done in their classrooms. It made them the experts and showed others that it can be done. I think your idea of having students do the presentations is interesting but I wonder if you can find 6-10 students confident enough to present to groups of teachers. I know quite a few teachers who would be intimidated by that prospect! Keep us posted!